The Merry Go Round is a carousel. It is average speed, it is fun, rerideable, it has a large capacity, and a long duration. There are 2 types of rides, that keep an amusement/theme park open--the rollercoasters and the carousel. Kennywoods carousel, is absolutely beautiful. What an amazing piece of artwork, from the handcarved horses, to the brilliant colors. The band organ plays great music. 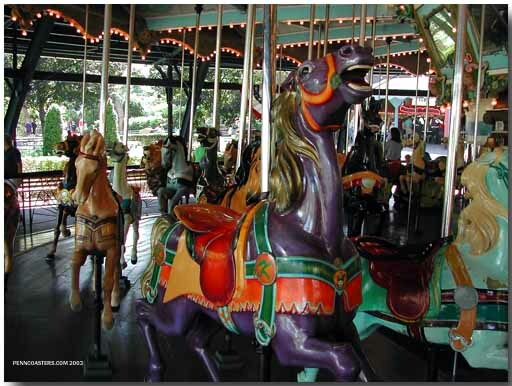 Yes, Im 43 years old, and I still ride the carousel, and yes, I even ride on the up-and-down horses. this merry go round is beautiful to look at, but the show stealer is, without a doubt, the crazy band organ. i sat for about an hour and didnt hear the same song twice. there are of course some sousa tunes, which i like, but there are also "modern" hits from bacharach and the beatles, all rendered in kick drum pounding, glockenspiel clanging, pnuematic organ wheezing, and snare drum rippling fashion. i confess to being more a band organ aesthete than a historian so i cant comment too much on the history of it, but suffice to say its a wurlitzer, probably not as old as some, but nonetheless slightly out of tune in a raunchy and loud way. among my favorites were "do you know the way to san jose", in which the B section of the song used a a very sickly out of tune voicing, but the rest of the song seemed mostly consonant. my friend and i couldnt stop laughing. even better perhaps were the incredible tempo dives heard in "ob-la-di-ob-la-da", giving it a very seasick quality. at one point late in the day the hood over the merry go round provided a great shelter from a quick summer rain. we all passed the half hour of the downpour by whittling down icecream cones, watching the horses and listening to the wurly amble through its songlist. it was a sublime few moments had in one of my favorite places, p-burg. Oh my God. What an amazing work of art! I cant belive that every wooded peice of this ride was carved by hand.WOW. What do you rate a carousel on? Seriously. Theyre pretty much all the same, but I liked this one. Its oldish and you can tell. Sometimes, I think I could rate a carousel on the music, but most of the time, its just really standard carousel music. Like, there must be a standard soundtrack for carousels out there and most of them use it, but then, you find some that play weird stuff and this one played odder tunes. Like "Sing a Song" by The Carpenters...that might have been the last thing I expected to hear. Actually, hearing "Ob La Di, Ob La Da (Life Goes On)" by The Beatles at Lake Compounce was the weirdest thing, but yeah. They were playing the same 4 songs on loop though, which is annoying. Other than that though, fun. My horse was pretty, went up and down. Fine with me. 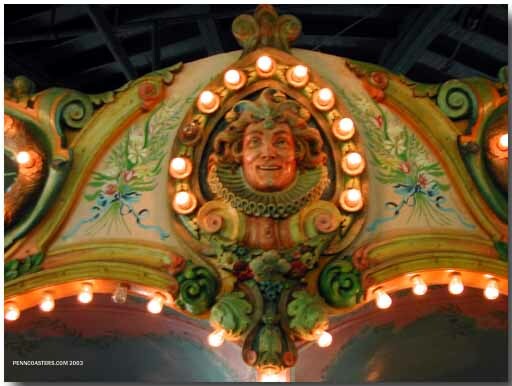 I like this carousel, like others have said, its very old fashioned... BUT, I think its a little scary to tell you the truth. I have been afraid of the weird carvings of faces and what-not since i was a kid! The music is creepy too... makes me think about psycho clowns.. haha! A very nice carousel, nice and old fashioned. Very beautiful, with some great organ music. My second favorite carousel next only to the Grand Carousel at Knoebels. Would be my favorite with a brass ring dispenser! Its a classic carousel, and I love the carving. Definitely better than the modern versions and has a great feel to it. Loses some points because I wasnt that impressed with the design of many of the horses/animals, Ive seen some much more spectacular hand carved versions. Although, the Lion is just one to never be forgotten. Nice center-piece to a more traditional time though. This is what a carousel is supposed to be! Beautiful placement in amongst some lush trees. The horses and other animals look fantastic, and it plays great old-fashioned music. Will bring a huge smile to your face and is definitely worth at least a couple rides. This is a real nice carousel, and even though its beautiful and plays wonderful music, and is one of my favorites, I dont think it deserves a rating higher than a six. Its still only a carousel.